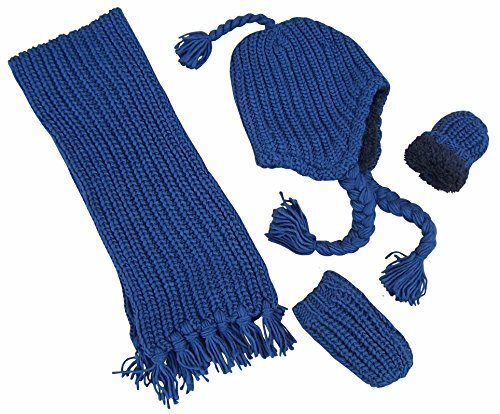 N'Ice Caps Big and Little Kids Unisex bulky waffle knit 3pc set with Sherpa lining. Hat has braided tassle and braided ties, scarf has knotted fringes and double knit finish at edges and ends. Hat has blanket stitch trim. Mitten has double knitted finished cuff. Colors: black, fuchsia, purple, turq, grey, red. Sizes:one size fits 2-4yrs, one size fits 4-12yrs, one size fits teens/adults. Tested and approved as per CPSIA standards.